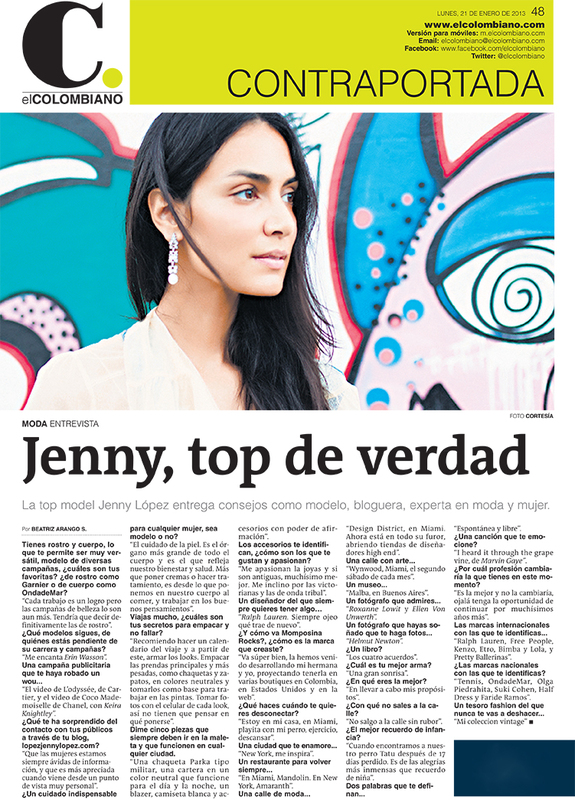 I feel very honored and happy to be news on the back cover of my hometown Medellin news paper El Colombiano. It feels good when you receive love and support from your people. Thanks for the lovely feature Beatriz Arango from Que Me Pongo, I really appreciate it my dear. Me siento muy honorada y contenta de ser noticia en la contraportada del periodico de mi ciudad Medellin El Colombiano. Se siente lindo cuando se recibe el apoyo y el cariño de tu gente. Gracias por el lindo articulo Beatriz Arango de Que Me Pongo, la verdad que lo aprecio mucho querida! *You have face and body, what gives you versatility, model for different campaigns. Which ones are you favorites? Face ads like Garnier or body ads like OndadeMar? Each job is an achievement but beauty ads are even more. I would have to say I love doing beauty ads. *Which models you follow their career? The Cartier L’oddyssée video and Chanel Coco Mademoiselle featuring Keira Knightley. *What has surprised you from your audience through your blog? That women are avid for information, and it’s much more appreciated from a very personal perspective. *A must care for any women is a model whether or not? Skin care is a must, is the largest organ in our body, it reflects the wellness and health. More than applying creams or treatments is more about what we eat, and work on positive thoughts. *you travel a lot, what are your secrets to pack and not fail? i recommend to have in mind your trip itinerary and from there put together the different looks. Pack the main and heaviest pieces, like jackets and shoes in neutral colors and take them as foundation to work on the outfits. Take pictures of each look with your cel phone, that way you don’t have to think about what to wear. *Five pieces you must take in your suitcase that work in every city? A parka militar jacket, a neutral color purse that you can take from day to night, blazer, white t-shirt and statement accessories. *Accessories make part of your identity which ones you like and you feel passionate about? I am passionate about jewelry and if is antique much better. Victorian and tribal. *A designer from where you always wanna have something? Every season I check Ralph Lauren. *How is Momposina Rocks going? How is the brand you created? It’s going really well, me and my sister have been developing the line and panning to have it in boutiques in Colombia, USA and web. *What do you do when you want to unplugged? I just stay home, at the beach in Miami with my dog, exercise and chill. *A city to fall in love with? *A restaurant to always go back? “Design District” in Miami now is blooming, lots of high end designers opening stores. Wynwood, Miami every second saturday of the month. Malba, In Buenos Aires Argentina. Roxanne Lowit and Ellen Von Unwerth. *A photographer you’ve dreamed that take pictures of you? *What are you best at? *With what you don’t go out with? When we found our dog tatú after 17 days missing. Is one of the greatest memories I have as a child. *Two words that define you? *A song that thrills you? *What would you trade your actual profession right now for? Right about now I would not trade it, hopefully life gives me the opportunity to do it for many more years. *International brands that you feel identify with? Ralph Lauren, Free People, Kenzo, Etro, bimba y lola y Pretty Ballerinas. *Colombian brands that you feel identify with? Tennis, OndadeMar, Olga Piedrahita, Suki Cohen, Half Dress and Faride Ramos. *A fashion treasure that you will never give away?